1400 Fold Box No charge For individual pens or pencils. 1400 Season’s Greeting Fold Box No charge For individual pens or pencils. 1600 Solid Grey Hinged Box $.60 For individual pens or pencils from our Photo-Logo Collections or pens from the Jazz or Maxx Series. 1900 Greytone Designer Box $1.25 For individual pens or pencils, for a pen and pencil set, or for an individual rollerball. 1300 Greytone Designer Combination Box $1.50 For rollerball-pen set, or rollerball-pencil set, or a trio set combining a pen-pencil-rollerball. 1300 Custom Greytone Designer Combination Box $ quote For a combination of writing instruments and an accessory item from our Gift Gallery. 1700* Greytone Presentation Box $7.00 Holds 12 Photo Logo Writing Instruments in Glass Tubes. Please order Photo Logo pens or pencils and glass tubes separately. GT* Glass Tube $.75 Minimum is 24 pieces. For pens or pencils from the Photo Logo Collections only. Not available for rollerballs, or for pens from our Jazz or Maxx Series’. VP Vinyl Pouch $.50 Available as supplemental packaging. Writing instruments are not inserted in the pouches at time of shipment. When it comes to adding value to a gift or presentation, Garland offers an exciting array of gift boxes to spice up any incentive or promotion. The #1400 grey fold box is our standard packaging for individual twist pens or pencils and is provided to you free of charge. From September through December, a special Season’s Greetings fold box is offered at no charge as well, lending a festive flair to your program, at no extra cost. Please request the Season’s Greetings fold box on your order. When we package our USA-Made rollerballs, the refill is always included separately. Rollerball refills are highly fluid, and therefore have a much shorter shelf-life than a ballpoint refill. We ship our rollerball refill cartridges separately with a high-quality protective cap to ensure that your product has maximum longevity when presented to a client or associate. Therefore, we recommend the #1900 Greytone Gift Box for individual rollerballs at a cost of $1.25 per box. This box is available with either a clear acetate top to show off your rollerball, or a rigid marbleized cover to keep your gift “under wraps” until presentation. (The fresh cartridge will be underneath the rollerball in the flocked insert, and instructions are included to explain how to load the cartridge.) If you choose our free #1400 fold box, please be aware that the refills will not be inserted in the rollerball or in the box. They will be bulk packed separately as will the instruction cards. For this reason, we highly recommend the Greytone Gift Box or one of our attractive Gift Packets for all rollerballs. #1600 Series Graphite Case: Our #1600 series box is a sturdy, dark grey Graphite Case which can hold an individual pen or pencil from our Photo Logo Collections or a pen from the Jazz or Maxx Series. This single item box snaps tightly shut and is crush-proof—the perfect solution when you need extra protection for items that are going to be held or stored for later distribution or shipped to individual recipients! Need to dress up your gift? This practical box takes on a rich new image when tied with a slim ribbon in a contrasting or coordinating color. #1900 Greytone Designer Box: The #1900 Greytone Designer Boxes are sure to impress when image is essential. The distinctive grey marbleized cover, wrapped with a dark grey band, creates a refined gift package that does not require any additional wrapping! Your writing instruments fit snugly in the custom shaped inserts of each Greytone Box. These Greytone Boxes complement the full range of colors and finishes offered on our writing instruments. 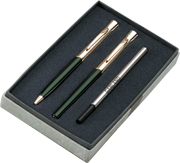 Enhance the quiet quality of our writing instruments when you present your gift in a Greytone Designer Gift Box. Greytone Designer Boxes are available with custom grey-flocked inserts to securely hold an individual writing instrument (pen, pencil or rollerball) or for a pen and pencil set from our Photo Logo Collections. All USA-Made Photo Logo Writing Instruments packaged in these boxes will include a business card with our lifetime guarantee, and instructions for return, should repair or replacement ever become necessary. When a pencil or rollerball is selected for the combination set, an instruction card for loading lead or inserting the rollerball cartridge is also enclosed. They are also offered for single pens from the Jazz Series. #1300 Greytone Designer Combination Box: The #1300 Greytone Designer Boxes offer the same elegant cover and design as our #1900 series box in a larger size to hold combination sets nestled in a flocked foam insert. 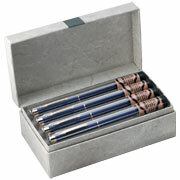 These boxes are available to hold a rollerball-pen set, a rollerball-pencil set, or a rollerball-pen-pencil trio set. All USA-Made Photo Logo Writing Instruments packaged in these boxes will include a business card with our lifetime guarantee, and instructions for return, should repair or replacement ever become necessary. When a pencil or rollerball is selected for the combination set, an instruction card for loading lead or inserting the rollerball cartridge is also enclosed. #1700 Presentation Box: Garland also offers an attractive Presentation Box, the #1700 series, which holds 12 writing instruments from our USA-Made Photo Logo Collections, each packaged in a clear Glass Tube. We recommend this Presentation Box for special occasions, executive gifts or as an updated version of a “cigar box”. Banking and real estate professionals can offer a unique and useful gift at closings or contract signings. The Director of an organization might consider presenting each new member with a writing instrument when they join the group or make a donation. As they say: It’s all about the presentation! Opening a Presentation Box and offering a client, member or associate a quality writing instrument will certainly make the recipient of your gift feel special, appreciated, and welcomed. Please note: the configuration of our Rollerballs, Jazz and Maxx pens preclude shipment in Glass Tubes and Presentation Boxes. Again, please keep in mind that Rollerballs, Jazz and Maxx pens cannot be packaged in Glass Tubes or Presentation Boxes. Vinyl Pouches: Vinyl pouches are a simple solution to provide ongoing protection for pens kept in tote bags, briefcases, purses or computer carriers. Pouches are shipped bulk packed; writing instruments are not inserted in the pouches. 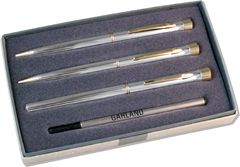 Combination sets in 1300 series boxes are available for packaging writing instruments with selected items from the Garland Gift Gallery. 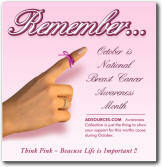 There will be a small surcharge to custom die cut the foam insert based on the items selected. Please contact us for information, availability, and price quotes. Everyone looks for promotional solutions that will create partnerships, recognize achievement, impress customers and leave a lasting impression. A Garland USA-Made writing instrument is a classic that endures, particularly when you add value with a combination set. These are not your usual giveaways, but a gift of enduring value for your best customers, members, clients, or employees. We offer a variety of combinations that stand out in stunning fashion. A traditional pen and pencil set is always welcomed, especially with personalized engraving on the barrel and an attractive Greytone Gift Box. Pairing a rollerball with a pen or a pencil is equally appealing and expresses gratitude with soft eloquence. Add a Gift Packet or the Greytone Gift Box for packaging, and you're sure to make the right impression. For more dramatic promotions or gift occasions, a trio set will perform over and over again. We’ve combined a rollerball, pen and pencil to create an upgraded option for gifts, tournament prizes, employee anniversaries and other special occasions. Many of our finishes and colors can be chosen for trio sets including our 785 series with a polished chrome finish and striking golden highlights. As you look at our product selection filled with colorful and appealing designs, keep in mind that combination sets are always available. Be adventurous. Be different. Promote your corporate image, and say thank you to those who are important to your success, with our dramatic combination sets.